The following is a joint statement issued by the AAUP, American Federation of Teachers, and Association of American Colleges and Universities on September 7, 2017. Additional endorsers of the statement appear below their names in the order of their endorsement. 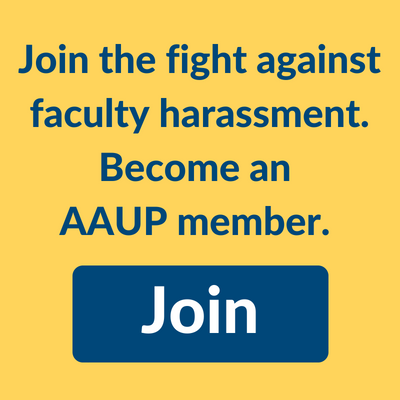 Institutional representatives who would like to endorse the statement should contact Debra Hanible at dhanible@aaup.org. In recent months a disturbing trend has emerged in American higher education. At a variety of institutions—public and private, large and small—individual members of the faculty have been singled out for campaigns of harassment in response to remarks they have made, or are alleged to have made, in public speeches, on social media, or in the classroom. Vicious threats of violence and even death have been directed against individual faculty members and their families, including their children. A large number of those threatened have been African American. The threats are often accompanied by calls for college and university administrators to summarily dismiss or otherwise discipline the offending faculty member. Sometimes the threats are also directed at those administrators or the institutions themselves. In some cases the comments made by the faculty member were highly provocative or easily misconstrued, but in other cases the allegedly offensive remarks were misattributed or not even made at all. In all cases, however, these campaigns of harassment endanger more than the faculty member concerned. They pose a profound and ominous challenge to higher education’s most fundamental values. The right of faculty members to speak or write as citizens, free from institutional censorship or discipline, has long been recognized as a core principle of academic freedom. While colleges and universities must make efforts to provide learning environments that are welcoming, diverse, and safe for all members of the university community and their guests, these efforts cannot and need not come at the expense of the right to free expression of all on campus and the academic freedom of the faculty. We call upon college and university presidents, members of governing boards, and other academic leaders to resist this campaign of harassment by endorsing this statement and making clear to all in their respective institutions that threats to individual members of the academic community, to academic freedom, and to freedom of expression on campus will not be tolerated.